That was the last Louis had heard from Allen. Not wanting to shake the boat, he resigned to never telling anyone about it: “The last thing I need for him is to read in the trades that I’m talking to everybody about it.” He continues, “I’ve told more people than I thought I should, but I’ve sworn them to secrecy. 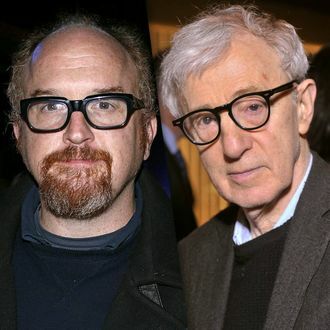 So when I saw something on Google about ‘Louie/Woody Allen buddy-picture possibility,’ I thought, Who told? And then I read that it was him, I was like, Thank God I don’t have to keep it a secret anymore.” He’s still incredulous about it actually happening but says he’d “love to do it.” We’d also love for them to do it. Come on, Woody, think up something. Here’s an idea: A Woody Allen type runs into his friend, a Louis C.K. type, on the streets of Manhattan, and they decide to catch up at a nearby deli. Throw in some jazz background music and you’re good to go.